…and how to fly over sea, without ever leaving the ground! 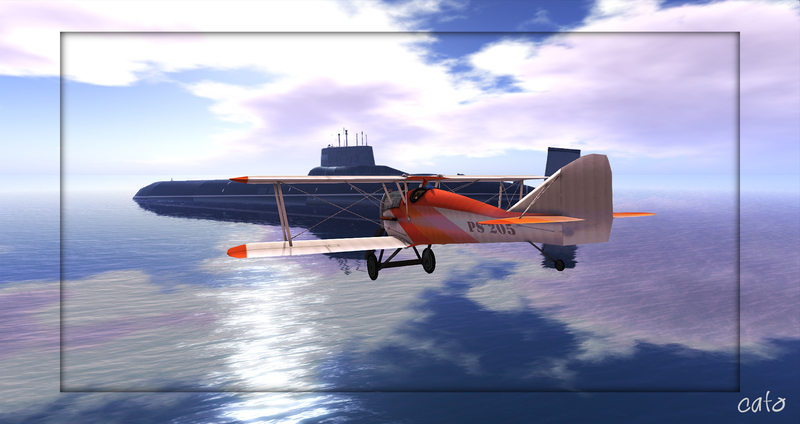 Today I had some fun with Parrot and the new premium gift, the Lindy Plane. 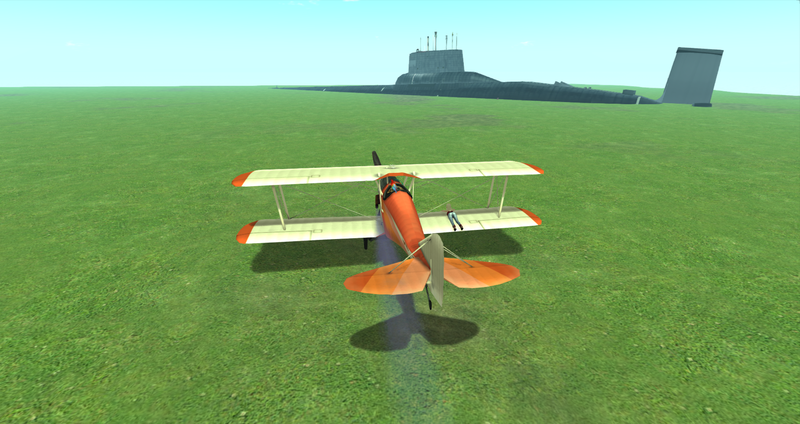 Since I am really, really bad in operating any kind of vehicle in SL – planes being the worst! – I had to resort to a neat little trick to make it appear we were actually flying over sea (oh, please don’t tell Parrot!). Looks like we were having some fun over sea, doesn’t it? Now, how did I do this, without flying and leaving the ground? I went to an as good as empty sandbox, and in my case I was very lucky someone was building a huge submarine! But ofcourse, you can always rez a boat or something yourself, if you like other props in your pic. 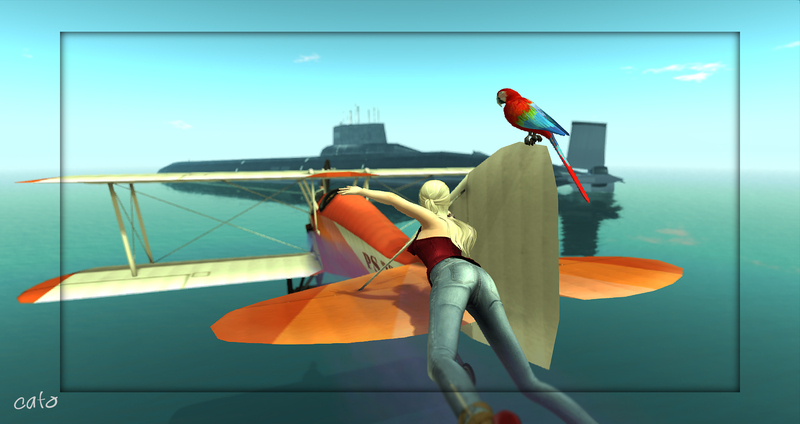 I then rezzed the plane and put Parrot in position, moved a bit around till I found the right angle with the submarine and the right pose in the plane (the Lindy Plane comes with some really cool and funny poses!). 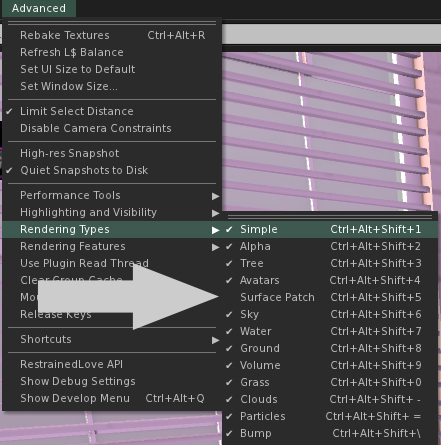 To make the ground disappear, you go to the Advanced menu (top of screen) and in ‘rendering types’ you UNtick: Surface patch. All will stay the same, although if you try to move the plane in the water, it will actually sink. You can move it about, but dragging it into the water takes a lot of patience, as it will keep sinking and stays a bit wonky (I tried, I gave up). You can stand up, you will walk on the ground you do not see! The moment you untick the Surface Patch, the ground is gone and you can pretend you are flying over sea, as my pics above show! For my photo’s I used Catznip Viewer, shadows and DoF enabled. Aw thanks colleen, I just had so much fun….!!! Wonderful photos and lesson, Caity!! That’s a Typhoon class submarine! One of the famous Asterion Coen’s subs. That one is sometime diving in black sea.